Clarets boss Sean Dyche is scratching his head about the latest managerial cull in the Championship. Paul Clement of Derby County and Rotherham United’s Neil Redfearn have both left their posts this week. That took the total of managerial casualties this season in the division to 13. Dyche is the third longest-serving manager in the Championship, behind MK Dons’ Karl Robinson, and Steve Bruce of Hull City, and the 11th overall in English football, after three years and just over three months at the helm. He recently agreed an improved contract at Turf Moor, but he admits: “I don’t know where the challenge is at, at the moment in the division. “There are no guarantees in this business, management isn’t an easy task. “Derby is a tough challenge – the owner went in the dressing room the other week. and that’s not ideal. It’s your job is to deal with the players. “Rotherham brought in Neil Redfearn four months or so ago, and he’s left this week. “I’m not sure what’s happened there, but results are hard to come by for everyone in the Championship. Clement’s departure was particularly baffling, with the Rams fifth, six points off top spot, having spent roughly £25m on improving the squad. 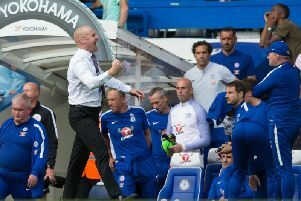 Dyche works under a somewhat different model at Turf Moor, but believes the health of the club is in superb shape: “Each club is different, certainly Burnley is. “If we had a lot of money, I would spend it, but not to the point where it would compromise the club’s future. “That would be my way of thinking, if someone has so much money, you just go and go again with it, you take it and spend it as wisely as you can. “But managers are judged on winning games, no-one cares if you buid a training ground, as we’re doing here, it’s just if you win games. “It’s about balance though, and I think that is the right thing to do for the club’s future. “If you’re looking at an overview of the club at the moment, a health check as such, we’re productive on and off the pitch, the players are developing, the training ground is coming along – the lads are working hard on that in dire weather. “The club is in a healthy state financially, and in the current scheme of things in football, we must be high up the ladder of overall concerns, in a market place where some situations are not in a healthy position. Burnley were in a position to sign James Tarkowski from Brentford for £3m on deadline day, and, the centre back came through 90 minutes in a friendly with Oldham at Gawthorpe on Tuesday. But he faces a tough task to break into the side at the moment, with the form of Michael Keane and Ben Mee. “We’re somewhat advanced in terms of the team and what we are trying to achieve, but he knew that and you don’t sign someone for three minutes, it’s for the longer term. The final emergency loan window is now open, but Dyche is relaxed about adding to his squad further: “We’ve got feelers out, and a couple of situations are warm. There are possibilities, but nothing immediate.